This is one of my very favorite knives in the whole wide world. The Buck 110 is all of America, made into a folding knife. It’s NASCAR, Apple Pie, Pump Action Shotguns, and ZZ TOP all rolled in together. The Buck 110 Folding Hunter has been around pretty much since the invention of America and folding, lock back knives… Maybe since cavemen were using clubs… I’m not sure. But there’s been generations of Americans using the 110 Folding Hunter out there in the fields, getting work done, and track record of success. But the 110 doesn’t get any love from the Tactical Community. It doesn’t have a fancy One Hand Opening feature. It’s not murdered out black. There are no GSG9 Agents rappelling through explosively breached ceilings with Buck 110’s clenched in their teeth. But really, the main problem with the Buck 110 as an EDC knife, is that it’s heavy. For a short period of time, Buck made the Ecolite version which steps away from the Brass and Wood, in favor of what they call “Paperstone”. Basically, it is recycled paper, compressed with resins. 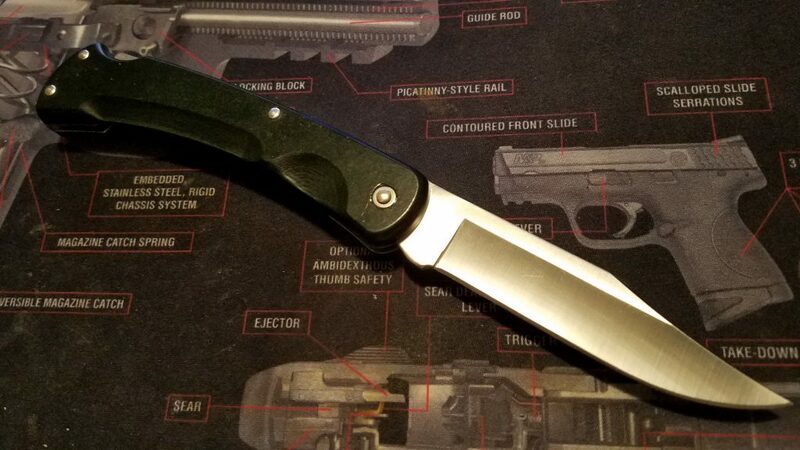 Here’s what I love about the 110 family… It’s all about that gorgeous blade. The blade steel is 420HC, with a Rockwell between 58 and 60. These blades are amazing. For a high carbon, it’s very corrosion resistant. It’s very sharp out of the box, and edge retention is superior to most production blades. Some 110’s can go up to a CPM-S30V Stainless blade steel, but you’ll notice the jump in price to about a hundred, and you won’t notice any great improvement in sharpness or retention. The 110 Ecolites were more nominally priced. I don’t remember what I paid, but it was about 50 bucks or less. Most 110 Folding Hunter knives are around 50 bucks. 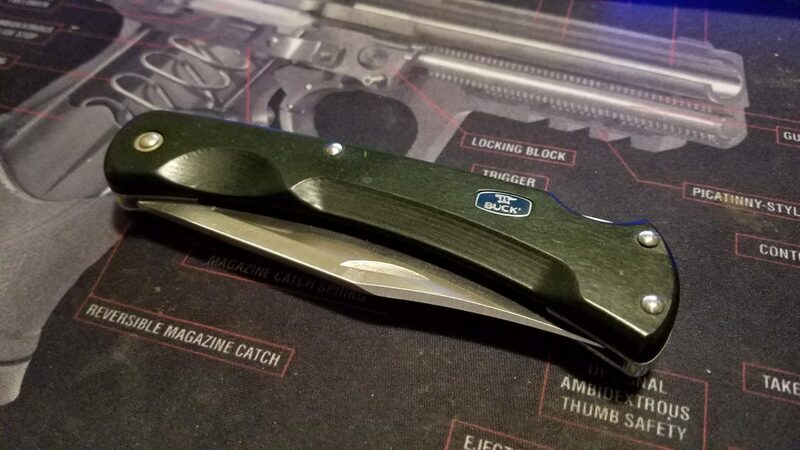 And now Buck has the 110 Auto’s, which are about 150, and the lightweight, plastic-handled “LT” knives for about 25 bucks. No matter which version you pick, the 110’s are the Folding Knives that all others are judged by. These set the standard. The nice thing about the Ecolites, is that Buck didn’t cheap out on the blade in any way. The 110 LT’s blade is cheaply finished, with a fine media blasted satin finish…. which is fine, but I like the polished finished on the regular 110 Folding Hunters, and on the Ecolites. It just feels better. Smoother, easier to clean. So while lighter weight than a standard 110, the knife still feels like it’s a high-quality knife – because it truly is. 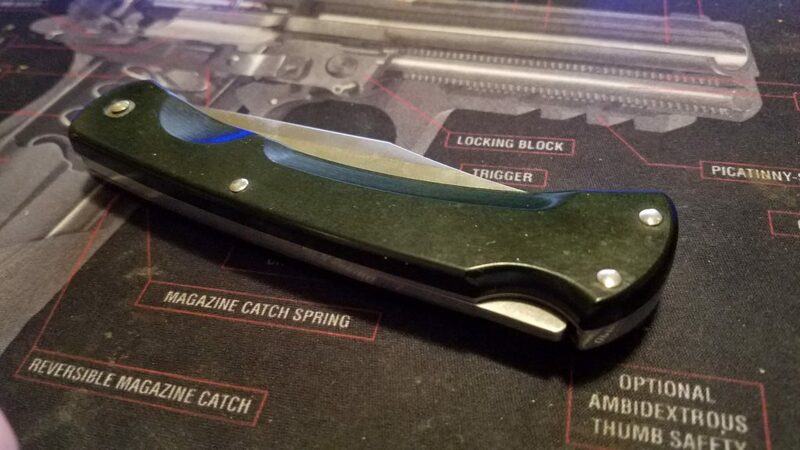 The other thing about the 110 Folding Hunters… Is the blade shape. It’s a more than just a “Clip Point”. It’s THE Clip Point, almost a classic little Bowie in shape. The tip is needle sharp, and with a blade length of 3 3/4″, it has a good usable length for big jobs, yet fine enough for delicate work. If the 110 has any shortcomings… is that it’s a Sheath Knife. There is no pocket clip. The LT versions and the Ecostones should have had a pocket clip, while the standard Brass or new Stainless bolstered knives, I can see using a sheath… they are quite substantial cutting tools. Okay, really, the lack of a pocket clip is the worst sin… and that’s quite forgivable because clips ruin the feel of a knife in the hand. A lack of a clip is nothing. You can’t go wrong with a Buck 110. If you don’t have one, you are probably either just wrong and this is an oversight… like maybe you thought you had one and lost it. Or you are just a horrible person and you need to fix this. Go. Now… Go get you a Buck 110. I carried a Buck 110 (which I still own) all through high school. The late ’70s and early 80s were a different country. I wish they would make one with G10 scales and a point-up pocket clip. If they did, they would have a repeat customer. 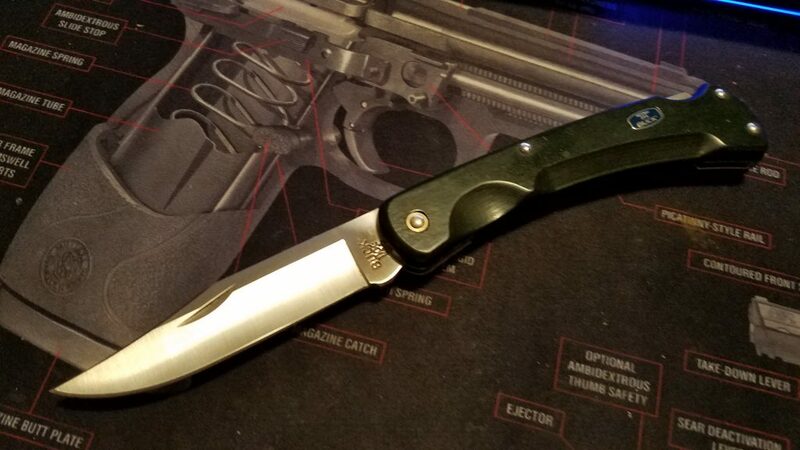 One of the “nice to own” knives I’d like to buy is the customised version of the 110 that Buck offers on its website. I’d get one with a stag handle and my name etched into the 420HC blade, and a brown sheath. That would make a good graduation present for each of your sons, also, if you don’t go whole hog like I did for my nephew and buy him his own Randall for a graduation present. Oh how I love the Buck 110. I do have one—sort of. Its actually my grandfather’s.